← How to convert HTML to bmp? How to convert Webpage to PGM? In the conversion from webpage to pgm in this article, you will not only get the introduction to the application Document Converter, you will also see the specific conversion steps about this conversion. Document Converter is a software product of VeryPDF which can convert MS Office documents, OpenOffice, HTML, Webpage, WordPerfect, AutoCAD DWG, PostScript, Adobe Acrobat PDF and many other document types to Adobe Acrobat PDF, PostScript, EPS, XPS, PCL, JPEG, TIFF, PNG, PCX, EMF, WMF, GIF, TGA, PIC, PCD and BMP formats. It works in three applications—GUI application, command line application and the virtual printer application. These three applications are designed for different purposes. You can choose any one of them according to your needs. When you want to make batch conversion, you can use the GUI application because it is good at batch conversion. When you need to develop some kind of new software, you may take the command line application as your tool. When you print documents, you can use the virtual printer to save paper and ink for you. The other identity of the virtual printer docPrint is the document converter which can also convert printable documents to image formats. Please download Document Converter for using docPrint at this link: http://www.verypdf.com/artprint/docprint_pro_setup.exe. To run the printer driver, you should open the webpage in a browser. Then click “File”—“Print” or press “Ctrl”+ “P” to open the “Print” dialog box. In “Print” dialog box, you are able to choose the current printer as “docPrint” in “Printer” combo box. Then please click on “OK” button. Open the “Save As” dialog box. To open the “Save As” dialog box through the docPrint main window, you can choose one of the following given ways. Please click the “Save File” button in the toolbar. The button seems like a floppy disk. You can click “File” and click “Save as” in the dropdown list. Press “Ctrl”+ “S” on the keyboard at the same time. To save webpage to pgm, you should do operations as follows. In “Save in” combo box, you’d better choose an output location for the target file. In “File name” edit box, you need to input the name for the target file. In “Save as type” combo box, please select the output format for the target file. 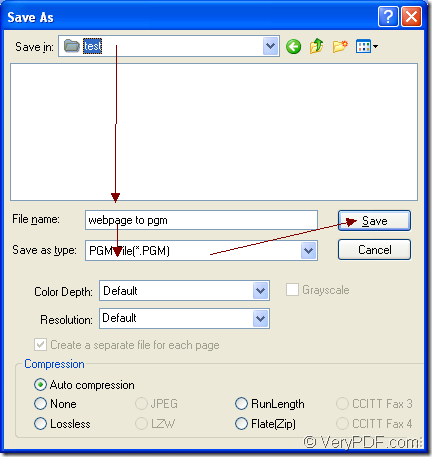 Click “Save” button to run the conversion from webpage to pgm. 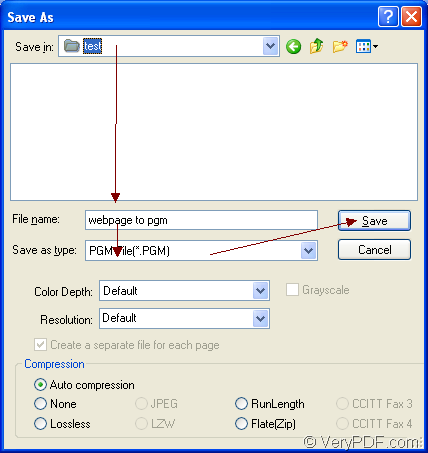 The “Save As” dialog box in shown in Figure1. To obtain more information about Document Converter, you can click here to visit its homepage. For reading more articles about docPrint, please enter the blog : VeryPDF Knowledge Base. Free PDF Viewer Portable… I really need it…? How to convert documents of Microsoft Office Excel to JPC?